I've written before about my own heroes, those I'll remember in a very personal way tomorrow, May 28th, 2012 - Memorial Day. I know none of them 'officially' qualify for remembrance on that day; but their memory is nevertheless important to me. However, this year I'm going to make the holiday more personal to me as an American, now that I've lived here for a decade and a half. I haven't lost a foxhole buddy here, nor have I served in the US armed forces, but many of my friends have. This year, I'd like to honor their fallen comrades as much as my own. In 1868 General John A. Logan, National Commander of the Grand Army of the Republic, issued his famous General Order #11. The first state to officially recognize the holiday was New York in 1873. By 1890 it was recognized by all of the northern states. The South refused to acknowledge the day, honoring their dead on separate days until after World War I (when the holiday changed from honoring just those who died fighting in the Civil War to honoring Americans who died fighting in any war). It is now celebrated in almost every State on the last Monday in May. It's easy to talk about deceased veterans en masse, or in the context of a vast, impersonal war. This year, let's make it personal. One man's sacrifice, and that of his wife - both very well publicized - will serve to represent the sacrifices of the many who've never attracted such attention. Many of you will remember an article in the Rocky Mountain News on November 11th, 2005. It was published by many other newspapers nationwide. It described the efforts of the US Marine Corps to bring their dead home with dignity and honor, and restore them to their families. A focal point of the article was the final homecoming of 2nd Lieutenant Jim Cathey, and his reception by his pregnant wife Katherine. At the sight of the flag-draped casket, Katherine let loose a shrill, full-body wail that gave way to moans of distilled, contagious grief. "NO! NO! Noooooo! Not him! Noooooo!" She screamed as the casket moved slowly down the conveyor belt. She screamed until she nearly collapsed, clutching Beck around the neck, her legs almost giving way. At the base of the luggage ramp, the screams hit the pallbearers. Of all the Marines they had met or trained with, Jim Cathey was the one they considered invincible, built with steel-cable arms and endless endurance - a kid who had made sergeant at 19 and seemed destined to leapfrog through the ranks. Most of the Marines who would serve as pallbearers had first met "Cat" at the University of Colorado, while enrolled in an elite scholarship program for enlisted infantrymen taking the difficult path to becoming officers. They partied with him, occasionally got into trouble with him, then watched him graduate with honors in anthropology and history in only three years. When they lifted his casket, they struggled visibly with the weight, their eyes filling with tears as they shuffled to the white hearse. After they placed the flag-drapped coffin inside, Katherine fell onto one corner, pressing her face into the blue field of stars. Beck put a hand on her back as she held the casket tight. By then, he was close enough to her to know that she wouldn't let go. He kept his hand on her back until he found a solution. "Would you like to ride with him?" he finally asked. She looked up, dazed, and replied with a sniffling nod. She took his hand again as he guided her to the front seat of the hearse, where the surprised funeral directors quickly moved papers to make room for her. 2nd Lt. Jim Cathey's body lay in state for several days at a local funeral home. Marines stood watch over him until the funeral. On the night before his burial, his wife stayed with him. 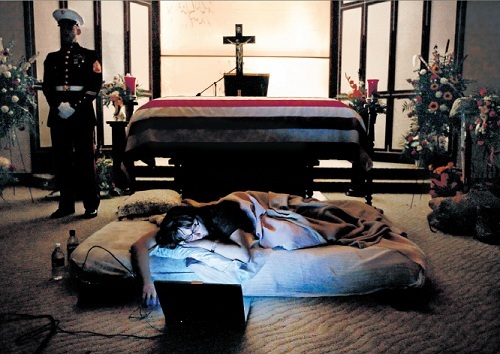 The sentry prepared a bed for her, with an air mattress, and she lay before his coffin, listening to music they'd played together, remembering their life together, feeling their unborn son kick within her womb. 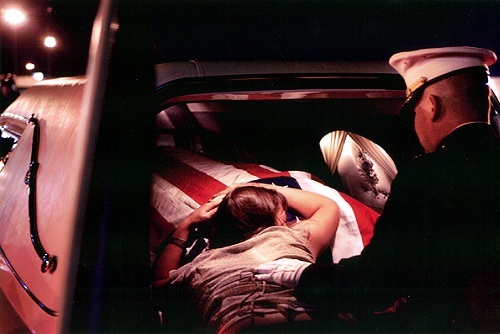 When the funeral was over, the Marines who'd known 2nd Lt. Cathey paid their own, very special last tribute. For a group of Cathey's friends, there was one more task. The Marines, many of whom had flown in from Okinawa the night before, walked up to the casket. 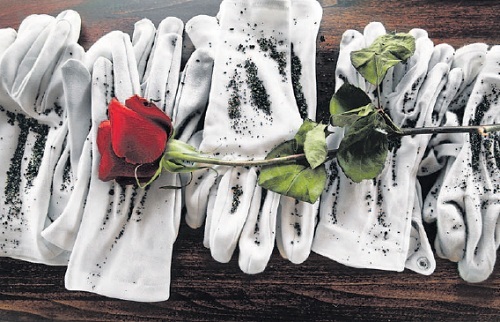 One by one, they removed their white gloves and placed them on the smooth wood. Then they reached into a bag of sand the same dark gray shade as gunpowder. A few years ago, while stationed in the infantry in Hawaii, Jim Cathey and his friends had taken a trip to Iwo Jima, where nearly 6,000 Marines had lost their lives almost 60 years before. They slept on the beach, thinking about all that had happened there. The day before they left, they each collected a bag of sand. Those bags of sand sat in their rooms for years. Girlfriends questioned them. Wives wondered what they would ever do with them. One by one, the young Marines poured a handful of sand onto the gloves atop the casket, then stepped back. Sgt. Gavin Conley, who had escorted his friend's body to Reno, reached into the bag, made a fist and drizzled the grains onto the casket. Once again, he slowly brought his bare hand to his brow. "(The day after sleeping on the beach), we all did a hike up Mount Suribachi, where our battalion commander spoke, and we rendered honors to all the fallen on Iwo Jima," Conley said. He looked over at the sand. "Now they can be part of him, too." The Rocky Mountain News is no more, but the article (without pictures) remains archived at its Web site. A complete version, including pictures, has been preserved elsewhere as an Adobe Acrobat document in .PDF format. I particularly recommend the latter version. 2nd Lt. Cathey's son was born on December 4th, 2005. "That cowlick - he has the same cowlick on the right side of his head," [Katherine] said of James J. Cathey Jr. "He has the nose. One of his ears sticks out more than the other like his dad. He has these really long fingers and feet like Jim. "And he smiles. He smiles a lot." "It's hard to throw stuff away. Even little notes I jotted down while he was still alive; I don't want to throw them away. I'm doing my best to save everything I can. I want to go through it with Jimmy. "I hope he asks a lot about his dad," she said. "I'm sure he will." Before he left for Iraq, the couple never talked about death. "I remember in Lejeune (N.C.) trying to bring something up about it," Katherine said. "He just started crying and said, 'I don't want to think about it. You don't know how scared I am.' I think he had a feeling that he wasn't coming back." When she's out in public, Katherine says she shies away from bringing up the story of her husband's death, worried mainly about making others uncomfortable. "Everyone says the same thing: 'I don't know what to say,' " she said. "I can't imagine being on the other side of it. I don't know what I'd say, either." "I guess I want them to say, 'Wow, what an amazing husband you had'." The soft green baby blanket no longer smells like 2nd Lt. James J. Cathey. "The night before he left for Iraq, I asked him to sleep with the blanket, so that when the baby was born, he would know how his father smelled," Katherine said, holding up the blanket she knitted while her husband was stationed at Camp Lejeune, preparing to deploy. "I can still see him there that night," she said. "He just held the blanket and slept with it. He went to sleep before I did, and I remember watching him, crying, thinking about how much I was going to miss him, and that he wasn't going to be there when the baby was born." She then lifted the blanket, leaned into the bassinet and wrapped it around her son. "The blanket smells more like a baby now," she said softly. "But there's something about Jimmy that also smells like his dad." I served in the military for 30 years. But it was impossible to fully understand the sacrifices of our troops and their families until April 29, 2007, the day my son, First Lt. Travis Manion, was killed in Iraq. Travis was just 26 years old when an enemy sniper's bullet pierced his heart after he had just helped save two wounded comrades. Even though our family knew the risks of Travis fighting on the violent streets of Fallujah, being notified of his death on a warm Sunday afternoon in Doylestown, Pa., was the worst moment of our lives. While my son's life was relatively short, I spend every day marveling at his courage and wisdom. Before his second and final combat deployment, Travis said he wanted to go back to Iraq in order to spare a less-experienced Marine from going in his place. His words — "If not me, then who . . . " — continue to inspire me. ... the essence of our country, which makes me even prouder than the president's speech, is the way our nation's military families continue to serve. Even after more than a decade of war, these remarkable men and women are still stepping forward. May this Memorial Day indeed be such a day, for all of us. This is the 4th or 5th time this year that I have seen Lt. Cathey's final story told and I cry each time. I was one of Lt Cathey's junior Marines when he was a Sgt and I cannot think of another NCO that I respected as much as I did him, even a decade later. For all those that never made it home from far flung lands, I will live my life as full as I can in honor of your memory, but will shed unabashed tears tomorrow in honor of your sacrifice. Darn dust, keeps blurring the screen. Thank you. We believe in our inner strength as a nation. It is why Memorial Day is so important to us. It is our chance to say Thank you, as a whole people. You have a wonderful way of finding news from all over and crafting into something to speaks to all of us. Thank you Peter. Well done Peter, thank you! Incredibly touching, and very appropriate for the day. Thank you for passing that along, Peter. It's the Isle of Man two-wheel madness parade! Lovers of Parmesan cheese had better stock up! Calling World War II British radar personnel! A US-created and -trained terrorist army? Watch out for that summer barbecue! A new danger of "cloud computing"
About those stolen US military weapons . . .
Now that's what I call a rally! What's in a name? Embarrassment! Enough brass to sink the Navy? That's a heck of a lens! The last vestige of planetary creation? RV's, or eclectic residences on wheels? The fuss over "gay marriage"
Artistry - with a forklift! Great Tennessee Air Show - worst parking ever! Who said photography was a safe occupation? Now that's a strict coach! But it's warm in here!